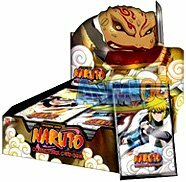 Naruto Approaching Wind TCG Booster Box br br 24 Packs - 10 Cards Per Pack br br Approaching Wind is the eleventh release for the Naruto CCG and introduces over 100 new cards. br br This is the first set to include characters from Naruto Shippuden TV episodes. The Naruto storyline skips two and half years into the future and all of the favorite Naruto characters have matured and grown more powerful. The Naruto CCG will begin to grow with these characters as we begin to introduce new versions of the most popular characters and their brand new Jutsus. New characters that will play a key role in the Naruto storyline will also make their first appearances. br br Approaching Wind will open a new chapter for the Naruto CCG universe and will lead it to all new levels of game play.